A great week of car news for you to read through, including a new fabulous-looking Porsche Boxster, a tuned F-Type and the shortlists for this year's cars of the year! Rumours of Jaguar's flagship sports car being given some beastly changes have finally been confirmed as true with this - the F-Type SVR. The car - developed by Jaguar Land Rover's Special Vehicle Operations department, the same team that did the Range Rover Sport SVR - boasts a whole range of excitable changes. Let's discuss the engine first and foremost, it's the same 5.0-litre V8 engine found in their limited-edition Project 7, meaning a whopping 567bhp, 200mph top speed and a 0-62mph time of just 3.7 seconds! Other noticeable changes include an eight-speed gearbox, all-wheel drive and a number of stylistic and aerodynamic upgrades. You also get carbon-ceramic brakes, stiffer suspension and a titanium exhaust - plus of course some SVR touches inside the car too! We can't wait for this car to make its debut at Geneva next month! Pictures of the new Vauxhall (or Opel for those outside the UK) GT Concept have been officially released ahead of its unveiling at the Geneva Motor Show. The car sports a rather peculiar looking concept based on the Vauxhall VXR and Opel GT from sixties, hence the tiny, two-door sporty look it has. The body seems to be similar to a BMW Z Series, with it's long bonnet and short rear. It does have a more sleek look though, with it's sharp creases, wide grille and LED lights. As with all concepts, it's a bit ugly. The red wheel is a bit odd particularly stands out. However, it does suggest that Vauxhall will be delving into more models in the near-future, and this particular one could be hinting at a new Tigra sports car. Porsche officially announced the latest Boxster at the end of last year, but have now released photos of the car and it looks fantastic. The 718 - a name which is taken from the 718 race car from the 1950s and 60s - is powered by a 2.0-litre flat-four petrol engine pushing a meaty 297bhp. There will also be a 'S' version too, which'll come equipped with a larger 2.5-litre engine capable of 345bhp. The former achieves a 0-62mph time of 4.7 seconds, whilst the latter is able to do the sprint half a second quicker at 4.2 seconds. The cars sport a far more stylish and modern look than previous models, with larger air intakes, bigger side vents, 19-inch alloys and some ultra-sleek LED lights on the front and rear. We'll let your eyes look for the other changes, but what about the price? Well the standard version will set you back £41,739 whilst the S is nearly £9,000 more at £50,695. Seems pretty reasonable if you ask us! The new Q2 crossover SUV is set to be Audi's smallest SUV when released in the summer, and we have our first images of how the car will look. Courtesy of our friends at AutoExpress.co.uk, their exclusive images show that it's considerably shorter than the Q3, with noticeable changes to the doors, rear and a sharper, more distinctive front grille. Under the hood there will be the choice of 1.0, 1.4 and 2.0-litre petrol engines as well as a 1.6 and 2.0-litre TDI diesels too. The lower engines will be available in front-wheel drive as standard but the high-spec models will offer the brands famous quattro all-wheel system. Not much about the car is known other than that, but we'll be sure to find out more when Audi show it off at Geneva in March. 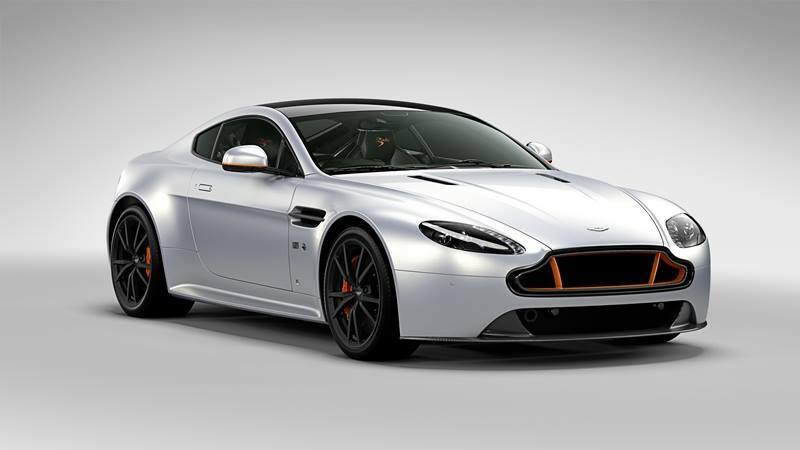 A special edition V8 Vantage S has been created by Aston Martin Cambridge and here it is - the Special Blades Edition. The car has designed to pay homage to aerobatic display team The Blades, and therefore comes in a grey and orange livery that matches the colours used by Northampton-based team. It also has a load of other branded touches including a new matching grille, wing mirrors, roof, front splitter, air vents, brake callipers and more. Inside it also sports Union Jack badges, orange stitching and The Blades' logo on the headrests. Only five cars will be sold due to their being the five planes in the team, and they'll set you back £119,950 each. However, there's only one left already as four have already been sold, so if you want it you'd better be quick! It's worth knowing that if you do decide to buy it, you'll be offered an experience package which involves spending a day at their headquarters at Sywell Aerodrome and getting a chance to fly with the team! Not a bad touch we must say. So the finalists for the 2016 World Car Awards have officially been announced and we thought we'd bring you the nominees in each category and our personal favourite too! A great selection of cars but the stand out for us is the Jaguar XE. It looks fantastic and shows just how much Jaguar have progressed since their acquisition by Tata Motors in 2008. We're not a huge fan of many of these nominees, but as it's an award based on luxury not looks, you'd have to give it to the 7 Series considering the vast amount of features and tech the new model comes equipped with. We'd happily own any of these cars but the stand-out performer in our books has got to be the Range Rover Sport SVR. In our experience the Range Rover Sport has never really driven like a true sports car, however this new generation seem to be nailing it and the SVR is one impressive step further. Other categories include the World Green Car of the Year and World Car Design of the Year. We'll bring you the results of every category when they're announced on March 24th at the New York International Auto Show.